[prMac.com] Richmond, VA - Like Thought is proud to announce Opacity 1.1, a major update to their innovative editor for screen graphics. This update adds SVG support, for creating vector graphics for the web, a screencast showing how to use Opacity, a new Image Fill option, and much more. Opacity requires Mac OS X 10.5.2 Leopard. Opacity has traditional graphical features like vectors, layers and filters along with exclusive features including variables, templates, factories and much more. By leveraging the power of Core Animation and Quartz, Opacity combines all of the tools artists need to create beautiful images for the icons, applications and the web. Opacity has full support for layers, including folder layers. Filters in Opacity are live layers that can be added to images (with a mask and opacity) and dynamically changed at any time. New in Opacity 1.1 is an Inner Shadow effect, joining the existing effects which include Reflection, Glass, Shadow, and more. Opacity 1.1 also includes many interface improvements. The toolbar now uses dynamically generated images to show what new vectors will look like. A new grid is available to help visualize designs, and many more improvements make Opacity even easier to use. Opacity streamlines the image creation workflow by combining a great vector editor and pixel editor with native support for all the formats needed for screen graphics. Vectors make it easy to draw great looking graphics, and a new image fill option gives them even more flexibility. Opacity is also ready for the future with support for easily preparing images for resolution independence-including with the newly added Scaleable Vector Graphics (SVG) support. Opacity also includes many unique new graphic editing features. Previews make it easy to see how an image will look when deployed, featuring faster and more accurate previews new in version 1.1. 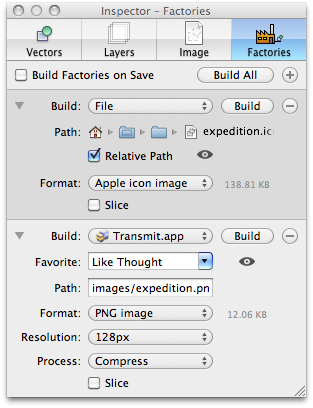 Opacity's Factories make it a snap to export images with only one click. In Opacity 1.1, Factories now support multi-page PDF images, gamma stripping in PNG images, and automatic uploading with Cyberduck. Factories are now extendable as well, allowing users to add their own Builders (Applications, Scripts, and more) that can process the images. Opacity 1.1 includes four new Templates to facilitate the creation of images suitable for icons, applications, and the web. Opacity requires Mac OS X 10.5.2 Leopard and is a Universal Binary for PowerPC and Intel Macs. A free trial version is available for download. The license cost is $89 USD.